I've often wondered what the business cards and personal stationery of William Shakespeare, Henry VIII and other historical figures would look like. I mean, who hasn't? Well, wrack your brains no more! 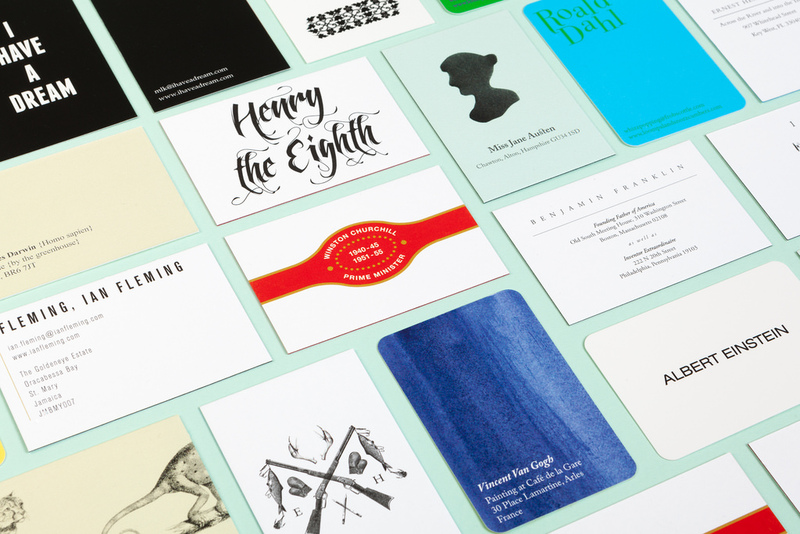 British online printing company MOO has created cards and letterhead for a dozen iconic names known for their strong personalities and penchant for writing and communications. • Martin Luther King, Jr.'s "I have a dream" layout, which conveys his message of hope in an appropriately bold and inclusive black-and-white motif. • The irony of Jane Austen's canny quote about friendship and financial reward (sense) rendered in a frilly, romantic typeface (sensibility). • Charles Darwin's card, clearly identifying the naturalist as a "Homo sapien," in case there were any doubt. • A damned spot (actually, an asterisk) playing off an age-old controversy by calling Shakespeare's authorship into question. • Albert Einstein's cleverly formulaic address, though judging from the ZIP code (20210, which is Washington, D.C.), there seems to be some confusion over the relative position of Mercer County, N.J., in space and time. See more at MOO's Flickr page. Via Design Taxi.